To kick off our new partnership with CBD Care Garden, we sat down with the CEO and Co-Founder, Vanessa Marquez, to ask her some questions about the company and their products. CBD oil and cream is now an upgrade you can add on to your massage. You can also find a few of their products in our Spa Lifestyle store. I’m Vanessa Marquez and I’m the Co-Founder and CEO of CBD Care Garden and we are a hemp-based wellness and beauty company. CBD stands for cannabidiol. It is an oil and it is extracted from industrial hemp. CBD is a superhero wellness ingredient and it’s very exciting because it’s not only incredible for the skin, it’s really effective for the body. Specifically looking at anti-inflammatory properties that CBD offers to the skin as well as permeating all the way to the bone, supporting bone health and supporting joints. It’s also wonderful at reducing pain and reducing the stress response that happens in the body from running our day-to-day lives. Receiving CBD in a treatment is not only wonderful for the skin, it’s also going to amplify the effects of the treatment. Does your product have THC? CBD is non-psychoactive and is a cannabinoid from the hemp plant. It does not then cause a high like you would from cannabis. Is it true that CBD needs THC to work best? What’s commonly thought is that CBD works better when in the presence of THC. In fact, with our line we use full spectrum hemp. What that means is that we actually take all of the THC out, leaving other cannabinoids and CBD. You’re still getting the “entourage effect,” even without THC and there’s been recent studies to show that CBD actually can work better without THC and its other cannabinoids. How can we experience CBD at Glen Ivy Hot Springs? You guys have the opportunity to receive the benefits of CBD Care Gardens products through a CBD enhanced massage service. Whether that’s our massage cream or CBD oil. You will be able to take home the CBD experience using our melt body butter. People absolutely fall in love with this and it works wonderfully not just all over the body to reduce inflammation and help support the skin, but in addition to that, helping to improve the face – you can use it as a facial night cream. The products [Glen Ivy] with also be carrying are lip glosses. These come with a built-in LED light and mirror. They come in 3 different colors, they all light up and they’re really cool at not just walking around and keeping in your purse, but using to protect your lips from UV damage, because CBD has cell protective properties. In addition to that, you will also have access to our moisturizing body and face wash bar. You can use this product, it’s free of sulfites, and wonderfully infused with our CBD hemp oil. 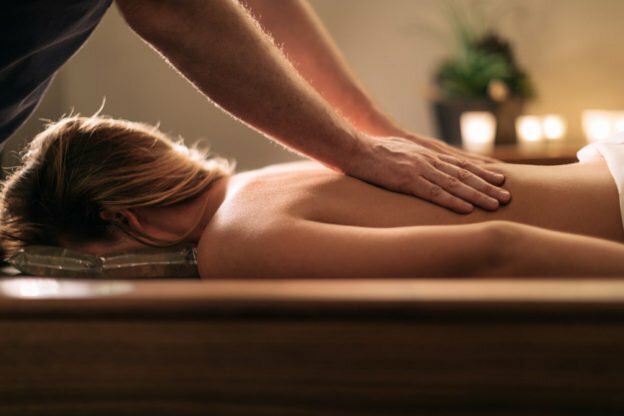 Experience the effects of hemp-based CBD and ask to upgrade your massage for your next appointment at Glen Ivy Hot Springs.